After numerous sell-out Australian tours, Steve Backshall, the star of the ABC ME hit TV show Deadly 60 returns to Australia with his deadliest show ever! Don't miss Steve's most exciting show ever - Deadly 60 Down Under!, featuring some of Australia's deadliest animals live on stage. Plus there will be audience participation, on stage fun and opportunities to ask Steve questions about all his adventures. Steve will share stories and videos from his Australian explorations… "I'm coming back to Australia! This time we're doing things a little bit different - we're on walkabout. We're travelling all the way down the East Coast of Australia on our Battle Bus - the ultimate Deadly tour bus. There will be stunts, audience participation, some of Australia's most extraordinary wildlife on stage and loads of craziness. 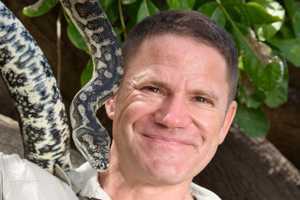 I cannot wait to see you there" Steve Backshall Naturalist Steve Backshall is best known for BBC Earth children's TV show Deadly 60, in which he tracks down the world's most dangerous animals. He is an author, expedition leader, naturalist, wildlife expert and a fearless presenter. Having travelled the world to learn about the most inspiring predators, Steve has swum with sharks, been bitten by a caiman, squirted with ink by Humboldt squid, flirted with a tarantula, charged by elephants, and stared out by thresher and great hammerhead sharks, but still maintains that wild animals pose no threat to people - in fact quite the opposite.